Multi language store fronts are fully supported by Magnet Commerce. You can translate all products, graphics, templates, storefront text, labels, banners, notification emails etc. to all different languages enabled on your online store. Any language you want to enable can be supported, all you have to do is contact us and let us know which languages you want to use!
! Apart from the multi language feature, Magnet Commerce also supports international shipping and tax rules, and multiple currency functionality. This is what makes Magnet Commerce the #1 solution for building stores that can sell in different markets around the world. Figure: Go to the "Setup > Languages" tab, to see the languages currently enabled and request for extra languages. Figure: To request for additional languages type the language and click "Send Request". Selected languages: The languages currently enabled on your online store. All products, graphics, templates, storefront text, labels, banners, notification emails etc. can be translated to all different languages enabled. Request another language: You can ask for a new language to be added at any time, by typing it in the "Language" text box and clicking "Send Request". The language will be enabled on your administration panel and store front, within one business day. To start with, the tab of the new language on your store front and administration panel will be empty. You will then need to setup all the language dependent parts of your e-store for the new language. For more information please read through the "Multi Language store - FAQs" section. 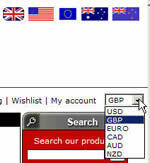 Figure: Multi language store front: store visitors click on the appropriate flag to change between languages. Figure: After clicking the French flag, the visitor is diverted to the French store version. 1) What are the default and secondary languages on my Magnet Commerce store? 2) When do I get to pick a default language for my store? Can I change my initial choice of default language? 3) Which are the language dependent parts of Magnet Commerce? 4) How do I add product categories in a multi language store? 5) How do I add products in a multi language store? 6) How do I add product page titles and product metatags in a multi language store? 7) How do I add product filters in a multi language store? 8) How do I add product variants in a multi language store? 9) How do I use the multi currency feature in a multi language store? 11) How do I add shipping options in a multi language store? 12) How do I add custom pages in a multi language store? 13) How do I add news in a multi language store? 14) How do I handle product reviews in a multi language store? 15) How do I add checkout questions in a multi language store? 16) How do I add texts (used on storefront and customer emails) in a multi language store? 17) How can I copy all product descriptions from the default language to a secondary one? 18) How does the bulk import functionality work when adding data in a non-latin language? When a visitor first opens a multi language store, all the language dependent content such as texts, buttons, banners, product names etc. will appear in the store's default language. You have defined a default language during subscription, but can also change it at a later stage. All other languages enabled on the store front are secondary languages. Visitors can use these flags to change between default and secondary languages at any page of the store front. When subscribing, you are asked to define a default language for your storefront. If you decide to change this at any time please contact us.
! Changing the default language on your store front means that the new language will appear when first opening your store's site. So please make sure you have setup all language sensitive content such as product descriptions, shop logo, custom pages etc. in the new language! Setup: General store settings: company name/country, shop name/logo, site description, keywords, homepage content, footer. When creating categories ("Catalog > Categories > Edit Category"), change between the language tabs to provide a translation for all different languages enabled on your store. When a visitor changes between languages on your store front he/she will see the appropriate translation of the categories, exactly as you have defined it. When you define a category in the default language, the category's title (not the description!!) gets copied in all secondary languages automatically. You will need to go through all different language tabs and provide the appropriate title translation and category descriptions. When creating products ("Catalog > Add Product"), change between the tabs to provide a translation for all different languages enabled on your store. When a visitor changes between languages on your store front he will see the appropriate translation of the products, exactly as you have defined it.
! In the shopping cart all products are shown in the language that was used to add them to the cart. When you add a product in the default language, the product's title (not the description!!) gets copied in all secondary languages automatically. You will need to go through all different language tabs and provide the appropriate title translation and product descriptions. When you add a new product on your Magnet Commerce store, the product page title (the title appearing on the browser when the product page opens) is automatically set to the product's name followed by your store's title. Additionally, the product's short description and name get added as metatags on your store's product page. These tags are automatically created from the product's name and short description that is initially saved for each language (the first time you click "Update Product Presentation" when adding a new product). If you translate the product's name and short description to a language at a later stage, the content of the tags in this language won't get updated automatically - you will have to translate these manually: in the "Product page title and description tags" section ("Catalog > Add Product > Promotion") use the language tabs to provide a translation for all different languages . When creating filter groups ("Catalog > Product Filters" or "Catalog > Add Product > Presentation > Manage product filters") you can provide a translation for all different languages enabled on your store. When a visitor changes between languages on your store front he will see the appropriate translation of the filters, exactly as you have defined it.
! If you don't provide a translation for one or more secondary languages, the filter group/type will appear in the default language. It is not possible to leave a filter group/type empty for a language. When creating variant groups ("Catalog > Product Variants" or "Catalog > Add Product > Pricing> Manage product variants") you can provide a translation for all different languages enabled on your store. When a visitor changes between languages on your store front he will see the appropriate translation of the variants, exactly as you have defined it.
! If you don't provide a translation for one or more secondary languages, the variant group/type will appear in the default language. It is not possible to leave a variant group/type empty for a language. If you want a different currency set for each language, please contact us. 10) How do I add tax rules in a multi language store? You can name your tax rules in any language and restrict them to specific countries/states/zip codes. Therefore, tax rules do not need to be specified for each language separately. You can name your shipping options in any language and restrict them to specific countries/states/zip codes. Therefore, shipping options do not need to be specified for each language separately. When you compose a custom page in a default language ("Site Content > Custom Pages"), the page is copied to all languages. You should edit the page for each language separately to provide the appropriate translation (otherwise the default translation is shown for all languages). When you compose articles to post on the "News" section of your store front ("Catalog > Add News"), you can provide a translation for all different languages. On the store front, the news only appear in the languages they were translated for. A visitor can add a product review in any language. You can publish the review on your store's product page. The review will be shown in all different language tabs, exactly as written. Check out questions are setup independently for each language ("Marketing > Checkout Questions"). Any checkout questions you add in the default language don't get copied to secondary languages. On the storefront, each language tab contains the checkout questions set for that language. Most of the text used on the store front and customer emails is translated to most languages. Whatever is not already translated appears in English. Go to the "Setup > Texts" to edit the translation of all texts, for each language separately. - export product descriptions using the "Catalog > Export" tab. The product export will be in the default language. - translate the descriptions exported to a secondary language. First create the file using a spreadsheet program (such as Microsoft Excel). For more information please read here. Then make a copy of this file, open the copy using notepad, save it using utf8 encoding and import it to your store using the Catalog > Import tab.
! Please make sure you make a copy of your initial file, as it is likely you won't be able to edit the file again once you've saved it in utf8 encoding!